Work sites are often the target of theft and vandalism, but this kind of criminal activity is a big liability for construction companies. Equipment and tools are not just valuable and expensive to replace, but they are necessary to get the job done safely, properly and on schedule. Security on construction sites is challenging because the area is constantly changing, and the project involves a lot of different workers from various companies. Unauthorized entry, theft and vandalism are major concerns, both for the construction company and for the property owner. Stolen or damaged equipment, tools and material is costly and can cause big delays in the work schedule. That’s why Great Valley Lockshop has compiled a list of recommended security measures. Protect the valuable equipment, tools and materials present on building sites, as well as your workers’ safety. Go through this list to make sure that your site is as secure as possible. Construction equipment theft statistics from the National Equipment Register. 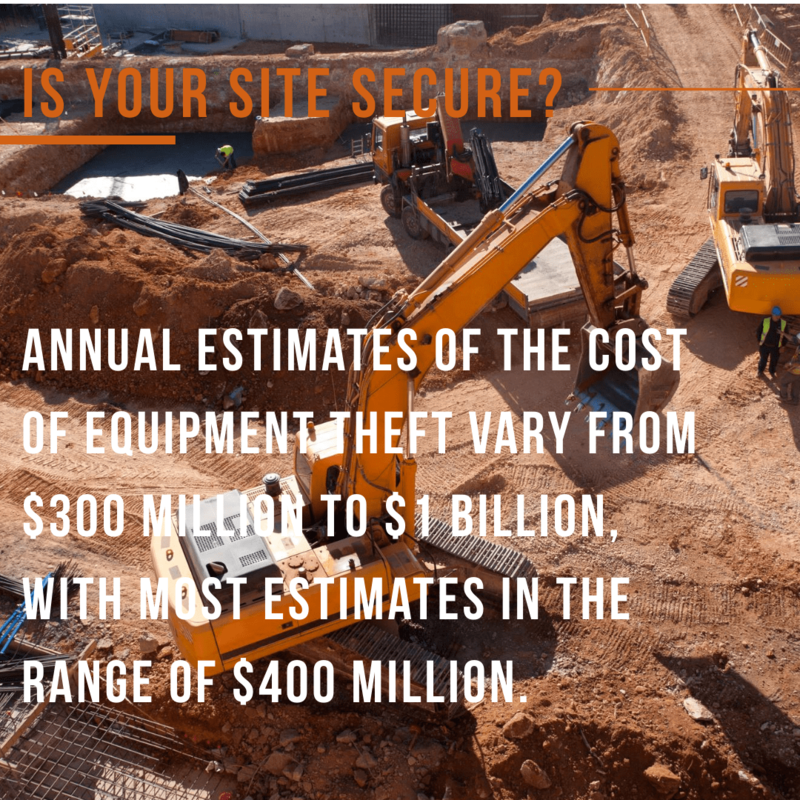 Is Your Construction Site Secure? Here are the top security measures which are advisable on a wide variety of building sites organized into a process with four phases. Develop a general job site security policy which can be shared with all workers and parties involved in the project. For each specific site, create a map of the site marking sensitive areas which need higher levels of security. Make a site-specific plan which states how the sensitive areas will be secured. Designate responsibilities for maintaining the established security measures. Charge one person with supervisory security tasks and ensure that workers understand his/her role. Go over these measures and roles with workers. Ask workers to be aware of any security issues. Review the procedure for reporting any suspicious activity. Share contact information with the managers of the properties nearby. Post a strong fence around the perimeter of the site. Maintain a clearance area along both sides of the perimeter fence. Post signage that clearly states that people are not allowed into the site without proper authorization. Limit access within the building site as much as possible. Establish a single entrance point for work vehicles. Ensure that workers and visitors have a safe parking area outside, but near the site. Use high-quality locks to secure the gate whenever the site is not active. Keep detailed records of security issues. Perform a check of the site and perimeter at the end of each workday. Make sure that all trailers, offices, sheds and gates are locked during non-work hours. Maintain ample light around the site to deter criminal activity at night. Maintain a record of the serial numbers and ownership documentation for all valuable work items. Label equipment and tools with the company name and an individual identification code to help keep track of it. Keep a detailed inventory of equipment and tools; take inventory daily. Close valuable equipment, tools and supplies locked in a storage trailer or shed whenever possible. Park work vehicles in well-lit areas, away from the perimeter fence overnight. Register your company equipment with services such as IRONwatch or HELPtech which are designed to help recover equipment in the case that it gets stolen. Keep spare master keys to vehicles locked in a safe place, preferably off-site. Lock all vehicle cabs when they aren’t in use. Don’t store unneeded equipment, tools, supplies or vehicles on site. Hiring a private security service to patrol during the night and other sensitive times of day. Installing security cameras to monitor access points, offices and storage areas for valuable equipment. Be sure to post adequate signage about security patrol and/or cameras which will also act as deterrents. Attach remote GPS tracking devices to all valuable equipment. Re-key the locks on entry points, storage facilities, trailers and mobile offices regularly. If you are concerned about how to best secure a commercial or residential job site, request a consultation with the professionals at Great Valley Lockshop. Our locksmiths can provide workable suggestions and solutions for a wide range of challenging site. Contact GV Lock to request a free quote by calling (610) 644-5334 or make a quick quote request online.